Details about the work done so far to get the site up and launched - blog, pages, social media, hosting & CMS info. The last few weeks, I have been beavering away, sorting out all the elements to launch this site: hosting, CMS (WordPress), Plugins, Theme Updates, Social Media Accounts, image sizes, fonts, analytics, schema – all sorts! It is all a work in progress, built agile rather than waterfall – key things are up and next steps have been planned – which is why this is a Soft Site Launch. This is a weekly look at news, updates and issues affecting Organic Search primarily, and Paid Search, if it affects Organic Search. It’s intended to give a brief summary of the issue, things to to / be aware of, further discussion and sources to check out. Keeping on top of these issues will help your SEO efforts to keep up to date. There’s an initial page up in the Digital Marketing Consultancy section, listing the primary areas I consult on. As start has also been made on the SEO Guides section, with the basic ethos of Find Crawl Index being explained (trust me, that’s an important page to read). 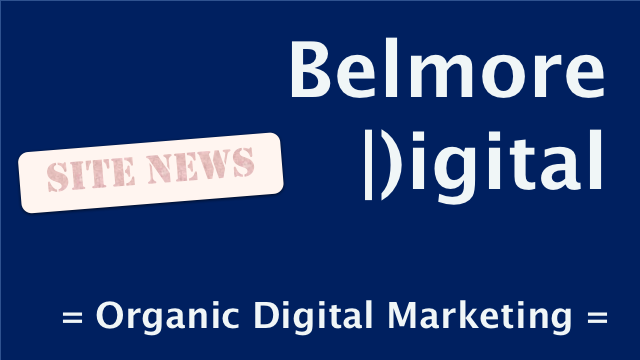 There’s a little bit about Belmore Digital, including the list of clients and market sectors I have worked on over the years. Of course, there’s also a page to contact Belmore Digital, with a form from NinjaForms to get in touch. There will be a 1300 number coming. There is a Sitemap Page, driven by the WP Sitemap Page plugin. This should list everything, although I haven’t played fully with the settings yet. Slightly more prosaically, there are Terms and Privacy pages as well, these are definitely “initial” versions. There’s not a great deal on any of these accounts yet, but they are there and ready to be updated. Some play is needed with the settings – especially on OG Tags and making sure the most valuable information (to me and the user) is displayed to the social media user. Follow them, if you prefer to be kept updated through Social, although be aware that the jolly old social sites don’t always surface business content, even if you follow it. Grrrr. I chose SiteGround’s mid-range WordPress package, hosting out of their Singapore centre, using the .com domain variant. So far, they’ve been pretty good. A couple of of support queries have been swiftly answered and resolved, and the service has been quick – with many options to make it quicker, should the site go big. The main plugins in use are Yoast SEO, WP SitemapPage, NinjaForms, hashtagger, Add Tags & Category. So far, they mainly do what they say on the tin, or I’ve been able to tweak a workaround. The theme in use is a modified version of XtremelySocial’s Flat Bootstrap theme. I like it. I like BootStrap, although making BootStrap work well with WordPress coding can be a bit hairy, usually there’s a workaround. Google Analytics has been added – plain installation currently. So has Facebook Pixel – again plain installation currently. Google Search Console is verified and logging data as I type. I think the homepage, and the section pages need prettying up, more content & styling added. I just have to work my way through the fun of WordPress to make it happen, without relying too much on plugins or heavy code tinkering. I also have to integrate cross-posting to social media for blog posts – automatically, or semi-automatically.